I was getting a little scissor happy the other night while trimming my ends but I must have cut off most of the knots like I’m supposed to because my hair felt so soft this morning. Most of it had shrunk in a really low fro. It was so low, I thought I cut too much off but then I wrapped a few strains around my fingers and pulled down. I still had my length. 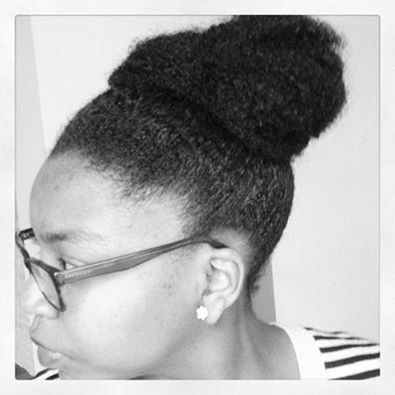 My hair looked cute, coiled and carefree as I swooped it into a top knot bun. I’m relieved to know that healthy natural hair, shrinks when wet. I do a lot of twist outs and lazy buns so I was happy to see it revert back to round coils and into a thick cloud. The knots made it look so dry and oddly shaped. Crusty ends are no fun! I’m so proud of myself for going natural and sticking with it. My hair is the healthiest now than it has been in years. It’s all because I took control of it. I put my hands in my own head of hair and took control.